A typical array layout consists of a series of 4-6 horizontal spots, representing a mini dilution curve of each sample (Fig. 2). Multiple samples may be printed on each slide, representing before- and after-treatment samples or normal and malignant tissue lysates. The use of multiple sample dilutions ensures the protein of interest is within the linear dynamic range of the assay, based on the antibody sensitivity and affinity. 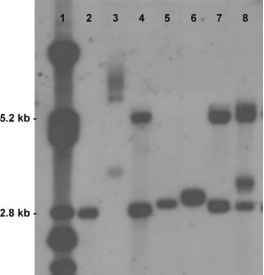 Protein arrays may also be printed in sector formats. A sector array consists of multiple small pads of substratum on a slide. A reservoir placed around each sector permits a different antibody to be used for probing the samples. The sector format miniaturizes the array, providing an increased signal/noise ratio, and is well suited to individual patient assessments. Through the sector array, multiple antibody probes can be multiplexed on a single slide. Thus on one slide, a complete set of analytes can be characterized and used to support a therapy decision for a single patient. For example, a sector array can be probed with antibodies spanning a key cell growth or apoptosis pathway targeted for therapy.